We thought it would be fun to include our 2007 Retrospective on the website. This end of the year reflection finds us trying to plan what we’re going to do for the next phase of our lives... because... let’s face it... there’s no way we’re going to “just retire”! I'm learning lots about building a website and having fun with it. SBI has made it easy for me to build this... maybe this is what we'll do in retirement. My goal is to find a way to have someone pay us to travel... great career, eh?! SBI is so much more than just a web host; it's an education in an inexpensive, easy to use package! You can even write a travel story if you want to see how easy it can be. Use one of these pages as a start, and I can put it up as a page on the Web. Click here to go from our 2007 retrospective to Share Your Story with Mousetours, Share a Clan McEwen/Clan MacEwan Story, or Amusing Confusing Roadsigns. Enough of that... let's get on with the 2007 retrospective. Drove to Thousand Oaks for the opportunity to fly with sister Carol and the 99s (lady pilots) and land at Edwards Air Force Base. Rare for civilians and very cool. On the drive home, we went wine tasting in the Santa Ynez Valley and Los Olivos.... a prelude of trips to come. MARCH: Australia..... Mark wrangled a 30 day leave of absence, and we took off for Australia. It was a long, wonderful wine tasting road trip. Flew straight through to Adelaide, rented a car and started in the Clare Valley... best known for Rieslings. Figured we might as well start with whites. Next came the Barossa Valley. Wow, do they make some GREAT Shiraz there! Made our way south around Adelaide to McLaren Vale for a couple of days. Then we took a couple of days off from wine tasting to visit Port Victor where we rode a double-decker, horse drawn trolley over a causeway to an island to see penguins; explore caves at Naracoorte with prehistoric giant kangaroo fossils, and find rock paintings in the Grampians National Park. Back to wine tasting in the Pyrenees wine region where we had a warm welcome from friends at Taltarni Winery. Drove to Melbourne Airport, parked the car and flew to Tasmania for three days.... exploring Hobart and the east coast... and wine tasting... great pinot noirs there. Flew back to Melbourne, picked up our car and made our way through the Yarra Valley for a short wine tasting afternoon, then on to Canberra to visit our travel buddy Billie. (She’s 84 and has been scolding us for not visiting.) Driving at night along country roads was one of the more nerve wracking things we did... most of the Australian wildlife comes out at night, and we heard many stories about what skippy can do if one jumps in front of your car. 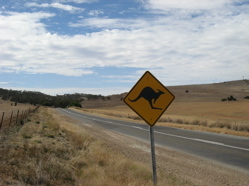 (Yes, Aussies really do call kangaroos skippy.) Thankfully we only saw them along the side of the road. After our visit with Billie, we drove north of Sydney to taste in the Hunter Valley.... and to cap the whole extravaganza off, we flew to Ayers Rock.... Uluru for Mark’s birthday. Great trip! Click here to read more about our Australian Wine Tasting Road Trip. MAY: Hungary, Slovakia and..... Missouri: We started in Budapest. Stayed on the Pest side, but walked and walked and walked exploring all Buda and Pest. After three days, we took a hydrofoil up the Danube to Bratislava, Slovakia, the center of which has been beautifully restored. 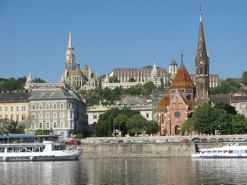 Spent a night there and took the hydrofoil back... this the FAST way to do the Danube Cruise seeing the “Danube Bend” that all the river cruise companies talk about. It’s hard for us to slow down long enough for the leisurely version! One last night in Budapest for some wine tasting, then we picked up a rental car and drove to Tokay for... guess what?? More wine tasting! Two days there, then two days in Eger where we tried Bulls Blood.... There’s a long story there about the local red wine. Back over the pond, and we made our way to Missouri. Met an old trekking buddy in St Louis and also visited the Creve Coeur Airport that Mark had been wanting to see for years... lots of great old planes. Then we drove down to just south of Branson (yea, THE Branson) to attend a graduation. 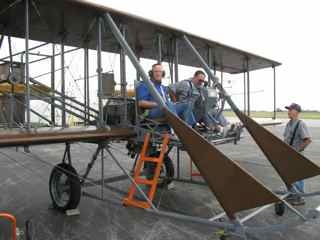 And here’s the ADVENTURE part... we both got rides on a Wright “B” 1911 Flyer “look alike”. We didn’t have to lie down like Orville and Wilbur, but we WERE sitting out in the open on the wing. THAT WAS SOOOO MUCH FUN!!!!! And we got toothpicks to get the bugs out of our teeth. We also took in baseball games at Cincinnati and Cleveland, found the small WACO plane Museum, and toured the Rock and Roll Hall of Fame. AUGUST: San Diego... to visit my college roommate and see the San Diego Padres.... since this year seems to be one of wine tasting and baseball. SEPTEMBER: Brussels, Berlin and Prague..... and Brooklyn.... Usually I name the countries, but we really did make this a cities trip. We started in Brussels and visited friends for a couple of days. Then we flew on a small airline... SN Brussels so we could go to an old airport in Berlin.... Templehof. It’s a holdover from the 1930s... you have to deplane down the stairs, but you’re parked under a cantilevered roof, and you enter the great old airport feeling like a movie star. We stayed in the Mitte area of Berlin... what used to be in East Berlin, and spent 4 days exploring Berlin and Potsdam. Flew to Prague and had a wonderful 4 day visit.... lots of music, including Don Giovanni at the Estates Theater where it debuted with Mozart conducting. Lots of walking admiring this beautiful city. Back across the pond and stayed with travel buddies. We explored more of Brooklyn, canoed on the Goanus Canal and... the reason for our visit -- we went to a Yankees game so we could see Yankees Stadium before they move to a new stadium in 2009. Enjoyed Fleet week over the Bay with the Blue Angels and the SFO debut of the Airbus 380... now this is pretty local, but we’d never done it and Mark has always wanted to. On the home front, we picked and crushed our grapes and helped the neighbors with their grapes... Quite a social event. NOVEMBER: Dallas.... to see travel buddy Jamie... Dallas Symphony, the House of Blues and lots of gossip. And what would our 2007 retrospective be without some home news? We worked on our 2006 vintage.... it’s been a learning experience, and one thing we learned is that making your own wine is NOT cheap. We’ll bottle after the first of the year and see if it’s drinkable. With this year’s harvest, we’ll give winemaking another try. Good thing we have great wine making neighbors to give us lots of help, advice... and encouragement! Hope you have all had a good year. Contact us -- or write a story -- we'd love to hear from you. Wishing you a prosperous, healthy, happy and peaceful 2008.